Welcome to The Abso!ute Sound online! We explore music and the reproduction of music in the home. We believe that the sound of music, unamplified, occurring in a real space is a philosophic absolute against which we may judge the performance of devices designed to reproduce music. Our goal is to provide the resources consumers need to judge how a component's sound either honors or departs from the music's truth, and to make sound purchasing decisions that maximize their experience of reproduced sound. Below is our Issue 150, October/November 2004 table of contents and editorial. Sue Kraft assembles a terrific budget system from North Acoustic, Tube Audio Design, and Marantz. Join Fred Kaplan for an exclusive visit to Sound/Mirror studios, where the legendary RCA Living Stereo catalogue is finally being mastered to SACD. Arthur Lintgen reviews the first batch of releases. Anthony Gallo's radical Nucleus Reference3 has caused Chris Martens to rethink what's possible in a $2600 pair of speakers. The biggest and most comprehensive list ever of our favorite gear in every price range — and this year's edition comes with a few new twists. Sue Kraft takes a listen to Steve McCormack's latest—a 500W solid-state behemoth. Robert E. Greene reports on an unusually effective analog equalizer. Robert E. Greene explains the Allison effect, and the latest attempt to tame it by the man who named it. 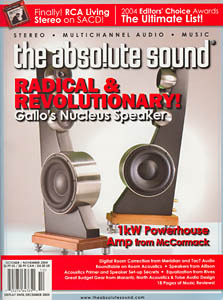 Our special Cutting Edge section begins with Robert Harley's Room Acoustic Primer, segues into TAS Roundtable, in which TAS' RH and Robert E. Greene and Acoustic Sciences' Art Noxon and TacT's Peter Lyngdorf contemplate room acoustics, and finishes with two reviews by Anthony H. Cordesman: the TacT RCS 2.2X DSP Room Correction System and the Meridian 861 Version 4 A/V Controller with Room Correction.